The Asian Human Rights Commission (AHRC) has received information from Centre for Research and Advocacy, Manipur regarding continued eviction of floating hut dwellers and destruction of their floating huts at Loktak Lake by the Loktak Development Authority (LDA) of the Government of Manipur and Manipur Police on 23 February 2013. Worryingly, the assault came despite the restrictions imposed by the Gauhati High Court on 25 January 2012. Though the Police and LDA personnel had to back off because of stiff resistance they met, they still destroyed two floating huts and fired in air. The eviction had started in November 2011 under the controversial Manipur Loktak Lake Protection Act 2006. Victims were further affected by the Ithai Barrage of the Loktak Multipurpose Hydroelectric Project commissioned in 1984. 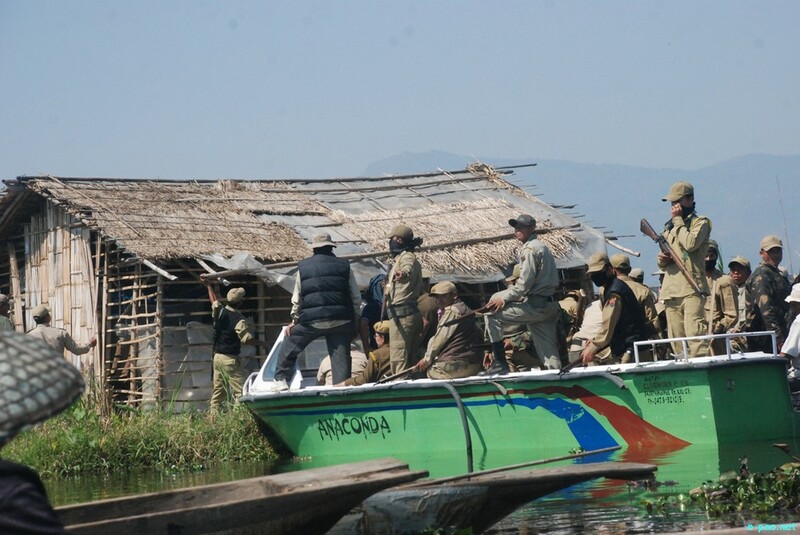 On 23 February 2013, Loktak Development Authority (LDA) and Police personnel reached Langolshabi, Loktak Lake and started dismantling floating huts of fishing communities belonging to the Meitei community. The LDA team did that defying the Gauhati High Court order of 25 January 2012 prohibiting clearance of phumdi-huts from Loktak Lake and subsequent contempt notice on 16 February 2013 ordering the government to desist from causing further eviction in Loktak Lake. The Gauhati High Court, in the contempt notice, had made it clear that necessary legal actions would be initiated against the Chairman of Loktak Development Authority, the Project Director of LDA, Deputy Commissioner of Bishnupur district and the Superintendent of Police if they indulged in any further eviction in Loktak Lake targeting the fishing communities. Defying the order, a Manipur police team led by OC of Moirang Police and accompanied by officials of LDA arrived with heavy machineries used for clearing floating vegetation mass in Loktak Lake, the Water Master Classic-3 and began destroying the floating phumdi huts. The personnel, apparently, had chosen the time carefully as most of the community members would be already out for work by morning and thus making it easier for the personnel. On meeting stiff resistance from the fisherfolks still present in the area, the police resorted to fire live rounds in the air threatening the community. An elderly woman Ms. Salam Memcha collapsed inside one of the canoes after a police personnel fired a live round of gunshot very close to her. In the standoff that ensued. The community members, however, did not relent and gheraoed the team forcing them to halt the operation. The personnel had already completely destroyed a hut belonging to Haobijam Premjit while another belonging to Haobijam Bino was partially broken down before being saved by the people. After listening to the ongoing operation, the local media persons rushed to the area and started documenting it. The LDA then decided to call off the operation for then even while warning the community that they would soon return to dismantle the houses with fresh orders of the Government. The LDA's eviction drive was carried out despite absence of any order for carrying out such eviction and they have failed to provide to the affected communities. They also allegedly threatened to burn down the huts. The eviction team comprised of LDA Executive Engineers Marjit, Gunamani and Sivavon and officer in-charge of Moirang police station among others. Please write to the authorities mentioned below demanding a judicial inquiry in this case. The AHRC is writing separately to the UN Special Rapporteur on the Rights of Indigenous Peoples as well as the UN Special Rapporteur on Adequate Housing asking for their intervention in the case. 1. Personnel of Loktak Development Authority, Manipur. I am writing to you with grave concern regarding continued harassment and eviction of the floating hut dwellers of Langolshabi, Loktak Lake in Manipur. As you might be aware of, on 23 February 2013, Loktak Development Authority (LDA) and Police personnel reached the area and started dismantling floating huts of fishing communities belonging to the Meitei community. The LDA team did that defying the Gauhati High Court order of 25 January 2012 prohibiting clearance of phumdi-huts from Loktak Lake and subsequent contempt notice on 16 February 2013 ordering the government to desist from causing further eviction in Loktak Lake. The Gauhati High Court, in the contempt notice, had made it clear that necessary legal actions would be initiated against the Chairman of Loktak Development Authority, the Project Director of LDA, Deputy Commissioner of Bishnupur district and the Superintendent of Police if they indulged in any further eviction in Loktak Lake targeting the fishing communities. Defying the order, a Manipur police team led by OC of Moirang Police and accompanied by officials of LDA arrived with heavy machineries used for clearing floating vegetation mass in Loktak Lake, the Water Master Classic-3 and began destroying the floating phumdi huts. The personnel, apparently, had chosen the time carefully as most of the community members would be already out for work by morning and thus making it easier for the personnel. On meeting stiff resistance from the fisherfolks still present in the area, the police resorted to fire live rounds in the air threatening the community. An elderly woman Ms. Salam Memcha collapsed inside one of the canoes after a police personnel fired a live round of gunshot very close to her. In the standoff that ensued. The community members, however, did not relent and gheraoed the team forcing them to halt the operation. 6. Respect Indigenous Peoples rights as per the UN Declaration on the Rights of Indigenous Peoples, 2007 in all development initiatives in Manipur and Ramsar Conventions in management of Loktak and other wetlands. Room No. 148 B, South block, New Delhi.